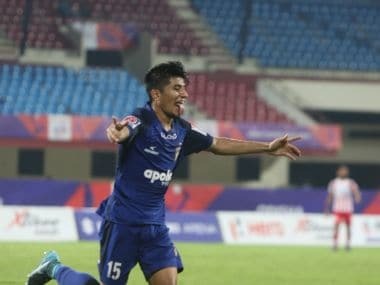 Pune: Cedric Hengbart scored the fastest goal of the third edition of Indian Super League but that wasn't enough for the Kerala Blasters as they were held to a 1-1 draw by FC Pune City on Monday. Hegbert scored in the 3rd minute of the match but Mohamed Sissoko's 68th minute equalizer ensured a point for the home team. Kerala Blasters were in fifth place with five points from five games while Pune City with four from as many games were a rung above FC Goa, who were languishing at the bottom of the heap. Kerala got the lead when Hengbart reacted quickly to finish with his left-foot after Pune failed to clear an Azrack Mahamat shot on goal. It was the French stopper's first goal in the ISL. 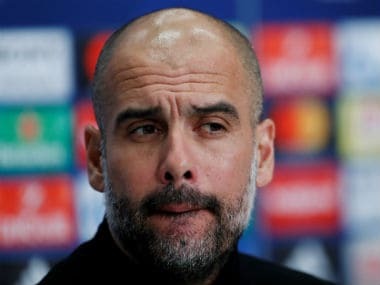 Jesus Tato volleyed wide from the edge of the penalty area 11 minutes later after an attempted clearance by the Blasters fell invitingly for the Spaniard. Dramane Traore was next to try and restore parity but his header from a corner sailed over the bar. Pune's next chance also went to Traore in the 23rd minute. The Malian found himself with space in the box when Aaron Hughes misjudged the flight of the ball and subsequently missed his header. Kerala's skipper was let off the hook, however, after Traore dragged his shot wide of the target. Mehtab Hossain came close to making it 2-0 for the Blasters in the 36th minute with a shot from range that went inches wide of goal. Tato whipped in a dangerous cross for Traore moments later but Hughes managed to apply enough pressure to deny him a clear header on goal. The first chance of the second half went to Mohammed Rafi thanks to a brilliant lay-off by Michael Chopra. Gouramangi Singh blocked Rafi’s shot on goal though to give his side a fighting chance in the game. Traore then almost capitalised on a weak back-pass from Josu Currais in the 56th minute. The Blasters' goalkeeper Sandip Nandy rushed off his line and did just about enough to thwart the danger. Traore finally put the ball in the back of the net two minutes later courtesy of a powerful header from a Rahul Bheke cross. Joy turned to disappointment within seconds for the Stallions after the lines-man raised his flag for off-side to cancel out the equaliser. 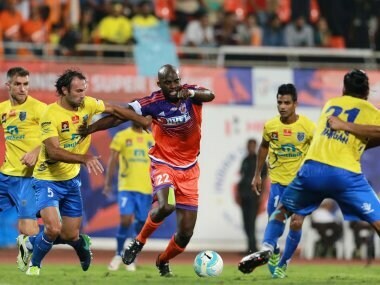 Pune eventually got their equaliser in the 68th minute with their marquee player and skipper Sissoko leading from the front. The 31-year-old’s shot from the edge of the box deflected off Hughes, giving Nandy no chance in goal. Kerala Blasters raised their game after the leveller. A goal-bound header by substitute Faruk Chaudhary forced Edel Bete into a spectacular save in the 72nd minute.